The 17894 is the 7-Ahr sealed rechargeable battery used inside the PS12LA or PS512M. It is only compatible with the PS12LA and PS512M (not the PS150 or PS200). The leads are soldered onto the battery posts. The 17894 is available as a replacement part. 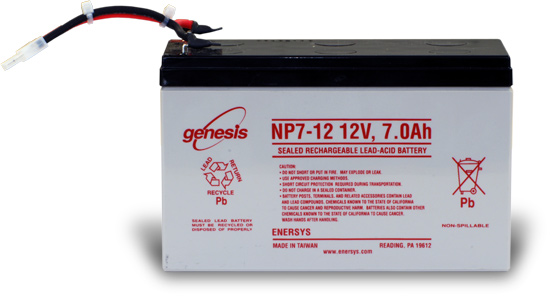 The 17894 provides the 7.0 Ahr sealed rechargeable battery used inside of the PS12LA or PS512M. It is only compatible with the PS12LA and PS512M (not the PS150). The leads are soldered onto the battery posts. The 17894 is available as a replacement part. The 17894 is compatible with the PS12LA and PS512M. It is not compatible with the PS150 or PS200 12 V Power Supply. What type of battery are the 6182 and 17894 (for example, nickel, alkaline, etc.)? The 6182 and 17894 are valve-regulated lead-acid (VRLA) maintenance-free batteries, also known as sealed, lead-acid batteries. If a fully charged 6182 or 17894 battery is used without a wall charger or solar panel, how long will the battery continue to supply power to a data logger? How long does a 6182 or 17894 last after a full charge? Just before measuring the high-current sensors, slow down the scan interval of the data logger program and switch on the sensors. Just after the sensors stabilize, take the measurements. Turn the sensors off immediately. Communication can also greatly affect the battery charge. Turn off any communications devices as much as possible to delay the battery discharge. Adding a solar panel and working out a power budget can balance out the charge with the discharge so that the system can be stable indefinitely. For more information, see the “Power Supplies” application note.